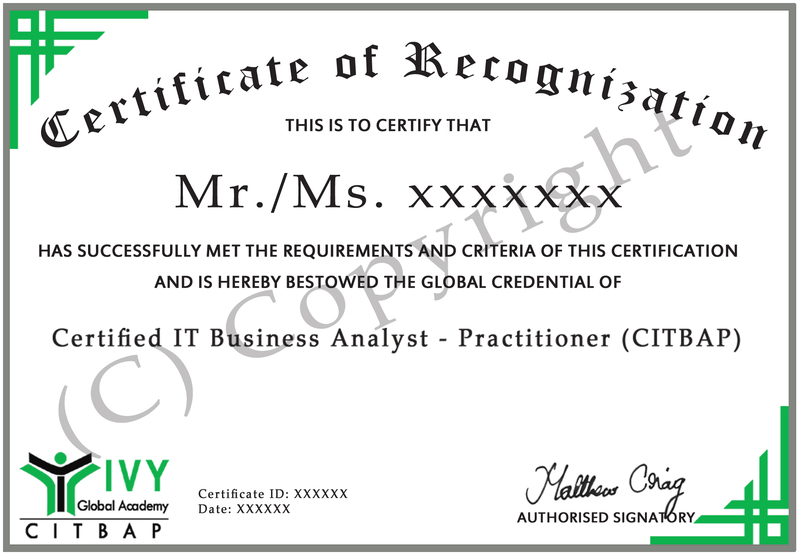 CITBAP – Certified Information Technology Business Analyst Practitioner is a prestigious Recognition for the Professionals who have the capabilities of driving IT Project to implementation at Clients place. CITBAP professionals will showcase skills on eight skill areas like BA Directives, BA Competencies, Software Development life Cycles like Sequential, Agile and Scrum, Functional Skills using Domain modelling and applying Business Process Model, understanding the technical stand through Object Oriented Approach (OOA) and communicating Requirements through Unified Modelling Language (UML), preparing Documents like Business Requirements Document (BRD), Functional Spec, Requirements Traceability Matrix (RTM) , Project Closure Documents, User Manuals, Fit for Support Documents and Lesson learned Documents and Usage of tools for Documentation, UML drawing and Wireframes and prototyping tools , Requirements Engineering and BA Strategy. Many professionals are playing the role of BA without having BA designation and Professionals contributing in the project management, requirements engineering, Quality , Testing, . For all these professionals, the best option is get certified as CITBAP to get into next levels of BA . score 70% (84 correct out of 120 Questions) to pass the exam. The total duration of the exam is 2 hours (120 Minutes). Exams are online and can be taken anywhere anytime. All you need is a reliable internet connection. The exam is conducted in a closed book manner. No external sources of information may be accessed during the exam. The certification is valid for life and does not require renewal. If a Candidate does not pass the exam in the first attempt, the candidate must wait for a period of at least fourteen (14) calendar days from the date of their attempt to retake the exam for second (2nd) time or any subsequent time. 1.1 Who is a Business Analyst? 1.5 What is Business Process Modeling?